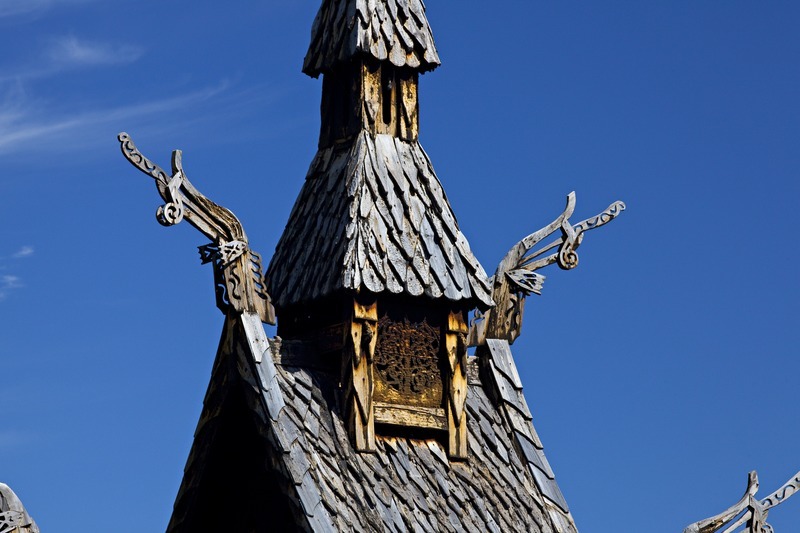 Among Norway’s most striking historical buildings from the Middle Ages are its wooden stave churches. Erected at a time when other parts of Europe were raising great cathedrals in stone, they are, in the words of UNESCO, “one of the most elaborate and technologically advanced types of wooden construction that existed in North-Western Europe during the Middle Ages.” The name stave church comes from the fact that they are built with a framework of load-bearing posts (“staver”). Urnes: One of the oldest of Norway’s stave churches, Urnes dates from approximately 1130 and is the most richly decorated of all the surviving stave churches. 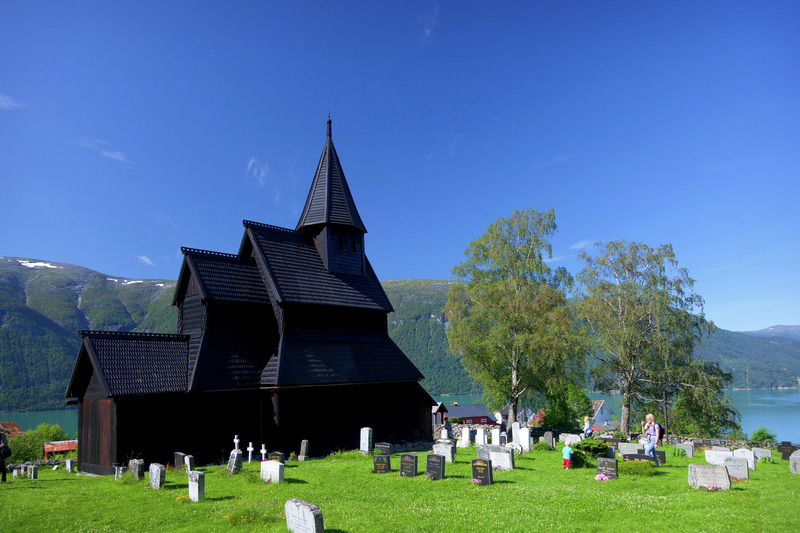 Located at Luster on an arm of the Sognefjord, it is the only stave church to be included on UNESCO’s World Heritage List. Built like a Romanesque church, but in wood, it contains many detailed carvings incorporating elements of Viking tradition that reflect features of a previous stave church located on the same site. The church also contains numerous liturgical artifacts from the Middle Ages. 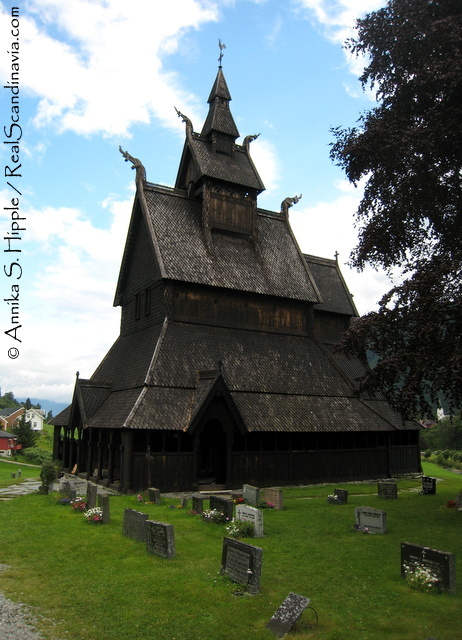 Borgund: Norway’s most visited stave church, Borgund is also one of the best preserved. Built around 1180, it is located near Lærdal at the eastern end of the Sognefjord. Also on site is a visitor center with displays on the history and significance of stave churches, as well as a new permanent exhibit on finds from the Viking era. Several runic carvings have been found inside the church, which is also known for its intricate door carvings and rooftop figures of dragons. The church is dedicated to the apostle St. Andrew. Heddal: The largest of the surviving stave churches, Heddal was built around 1250 and has remained in constant use through the present day. As a result, influences from various historical eras can be seen in its decor. 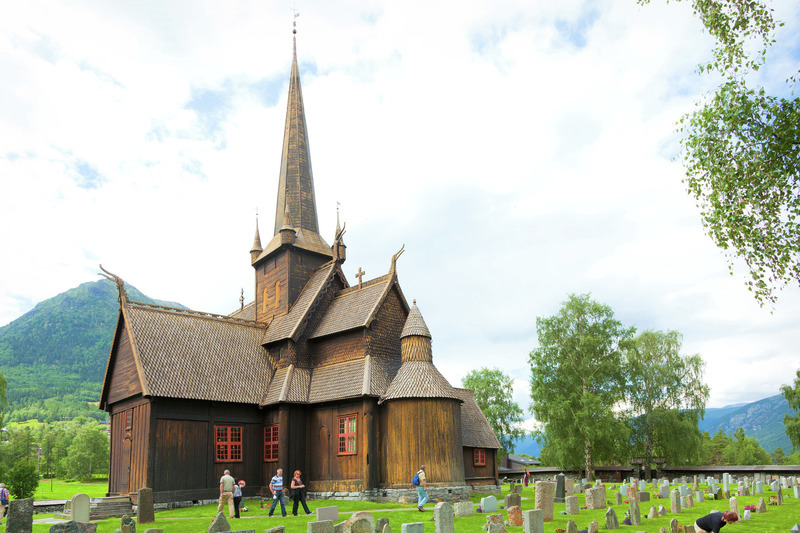 Heddal stave church was restored in the middle of the 19th century and again in the 1950s. 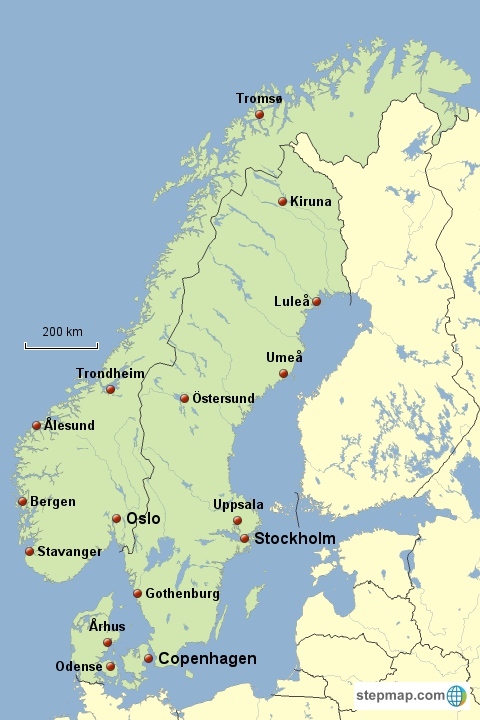 It is located at Notudden in Telemark. Hopperstad: In the small town of Vik on the southern shore of the Sognefjord is Hopperstad, another of Norway’s oldest stave churches. The church’s origins remain somewhat unclear, but it was most likely built in the 1130s. Over the centuries it fell into disrepair, but it was painstakingly restored in the 1880s. The main portal of the church is carved with dragons and intertwined vines. 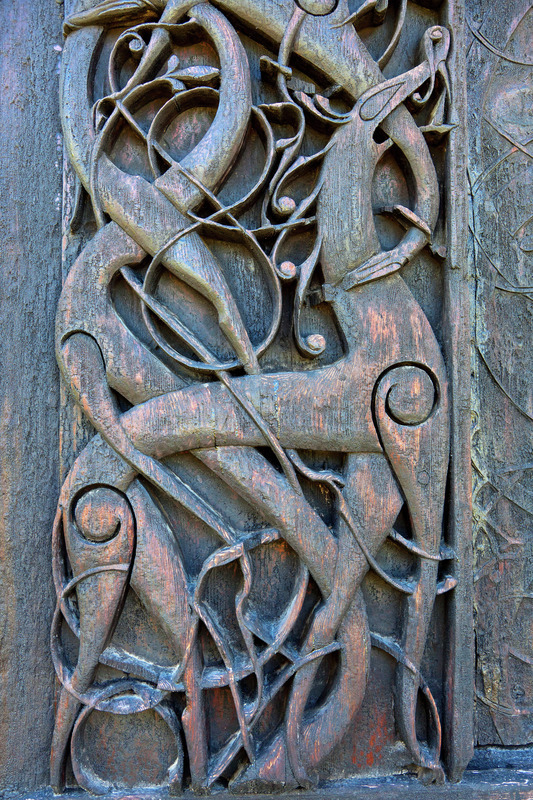 Gol (moved to Oslo): If you can’t get to any of the remaining stave churches further afield, you can see an example at the Norwegian Museum of Cultural History (Norsk Folkemuseum) in Oslo. Originally located at Gol in Hallingdal, the church was dismantled and moved to Oslo in the 1880s under the initiative of King Oscar II of Sweden and Norway. Because the church had been altered over the centuries from its original mid-13th-century design, the exterior was reconstructed based on the Borgund stave church. 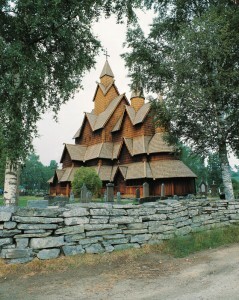 A replica of the stave church was erected in Gol in the 1980s, though not on the site of the original. Eidsborg: One of the best preserved stave churches, Eidsborg was likely built around 1250. It is a single-nave church dedicated to St. Nicholas and is part of the West Telemark Museum. Flesberg: Located at Flesberg in Buskerud, this church was built in the late 12th century with a rectangular nave and expanded in 1735 to a cruciform shape. The original church now forms the western arm of the cross. Garmo: Originally built at Lom in Gudbrandsdalen, this church now stands at the Maihaugen Museum in Lillehammer. It was first built as a single-nave church but was expanded into a cruciform shape in 1730. Its oldest parts date from the 13th century. Grip: Located on the island of Grip near Kristiansund, this is a small, simple stave church whose exact age is uncertain, although it is generally believed to have been built in the late 1400s. Haltdalen: This church actually incorporates parts of two original churches, from Haltdalen and Ålen. For this reason it is sometimes called the Haltålen Stave Church. Its oldest sections date back to 1170. Located at the Sverresborg Trøndelag Folk Museum in Trondheim, it is the only surviving example of the Eastern Scandinavian single-nave stave church style. Hegge: Built 1235-1265 and restored numerous times over the years, this triple-nave church is located in Øystre Slidre in Valdres, where it is still used as a parish church. Hedalen: Most likely erected beginning in the 1160s, this stave church was expanded and given a cruciform shape in 1699, with the original church forming the western arm of the cross. The elaborately decorated portal with three dragon figures dates back to the church’s original construction. Other medieval treasures include a crucifix from 1270 and a Madonna sculpture from 1250, the latter returned to Hedalen in 2005 after many years in the Museum of Cultural History in Oslo. Restored and given a new choir in 1902, Hedalen stave church is located in Sør-Aurdal in Oppdal. Høre: Tree-ring analysis and a runic inscription on the pulpit place the construction of this church at around the year 1179. Although the church has undergone changes over the centuries, most of the medieval stave construction is still intact, and the church remains in use today. It is located at Vang in Valdres. Høyjord: Located in Andebu parish in Vestfold, Høyjord has a choir dating from the end of the 12th century, although the nave was not raised until about a century later. Most likely the original nave was torn down and a new one built and connected to the existing choir. Among the remaining original sections are the twelve load-bearing and individually decorated staves. 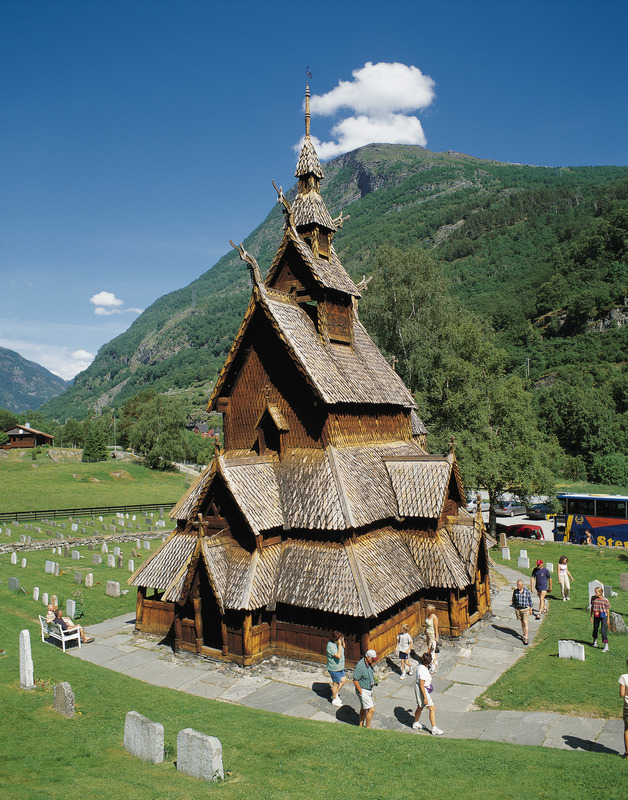 Kaupanger: The largest stave church in Sogn, Kaupanger is located in Sogndal by the Sognefjord. Probably built in the second half of the 12th century, it is supported by 22 staves – the largest number found in any surviving stave church. It is one of the best-preserved stave churches. Kvernes: Located at Averøya near Kristiansund, Kvernes is one of the younger surviving stave churches. It has been rebuilt several times over the years, but the oldest parts are from approximately 1300. One unusual feature is the diagonal external props supporting the walls. Archaeological finds have shown that the church is located on a site of ancient pre-Christian religious importance. Lom: One of the largest stave churches in Norway, Lom was built after about 1158 in the municipality of the same name in Oppdal. The church was expanded into its current cruciform shape during the 17th century and is still in use as a parish church. Large portions of the nave, apse, and choir remain from the original church. Lomen: Located in Vestre Slidre in Oppland, this fairly simple stave church was likely built in the late 12th century, as tree-ring analysis has determined that the wood used in its construction was hewn in 1179. Used as a parish church until 1914, it is now used only on special occasions such as the 17th of May (Norwegian Constitution Day) and St. Olaf’s Day (July 29). Although portions of the church have been altered over the centuries, numerous staves, wall sections, and portions of the roof are original. Nore: Tree-ring dating places the construction of Nore Stave Church at sometime after 1167. Unlike most other churches of the time, it had balconies, a choir, an apse, and cross arms. Located in the municipality of Nore og Uvdal in Buskerud, it was partly rebuilt several time during the 17th and 18th centuries, but large parts of the original building remain. Reinli: Dated to sometime after 1326, Reinli is one of the best-preserved Norwegian stave churches and the only one built as a long church with a single nave and a chancel of the same width and height. An apse was added later, along with other modifications. The nave, chancel, wall, and roof date are all medieval, although the interior was completely redone in the late 19th century. Ringebu: Located in Gudbrandsdalen, this large stave church has been in use since its construction early in the 13th century. It was expanded around 1631, when the medieval galleries, apse, and choir were torn down and a new transept, choir, and tower were added. Numerous original parts remain. Rollag: The age of this stave church in Rollag in Buskerud is difficult to determine, although it has been dated back to the 15th century and may well be older. More precise dating is complicated by flooring and wall coverings, as well as numerous rounds of remodeling over the years. The original stave construction is intact but difficult to see. Rødven: Located in Åndalsnes in Møre og Romsdal, Rødven Stave Church has portions dating from the 12th century. It has external supports which may be from the original construction. Parts of the church have been extensively rebuilt. Røldal: Built in the first half of the 13th century, Røldal Stave Church contains a baptismal font from the same time period, as well as a crucifix from around 1250 that is said to sweat once a year, on July 6, with miraculous healing power. The church was one of Norway’s most important pilgrimage destinations during the Middle Ages and remains in use as a parish church. Torpo: The only Hallingdal stave church still in its original location, Torpo is located in Ål in Buskerud and was built sometime after 1192, according to tree-ring analysis. It contains a runic inscription stating that it was built by a man named Torolf. The church is known for its paintings from the 13th century. Undredal: Built in 1147 near the Nærøyfjord, this single-nave stave church is said to be the smallest church still in use in Scandinavia. 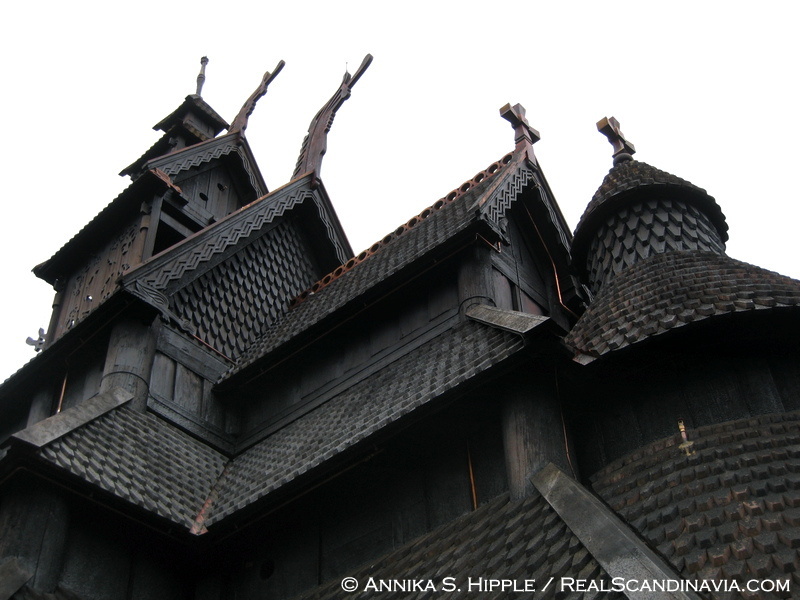 Its white clapboard sidings give it a different look from many other stave churches. Uvdal: Based on coins found during archaeological excavations in 1978, Uvdal Stave Church was likely built during the late 12th century. Located near in Nore og Uvdal municipality in Buskerud, it has been altered numerous times over the centuries, making it unlike most other stave churches. Øye: Located in Vang in Valdres, Oppland, Øye Stave Church was originally built around the year 1200 but was torn down in 1747 to make room for a new church. The stave church was reerected in the 1950s using original materials recovered from beneath the site of the new church. Fantoft: Located in Bergen, the Fantoft stave church is not counted among Norway’s 28 extant medieval churches because the original was destroyed by fire in 1992. Originally erected around 1150 in the village of Fortun at the eastern end of the Sognefjord, it had been moved piece-by-piece to Fantoft in Bergen in 1881. Following the fire, the church was rebuilt exactly as it was. Most stave churches are open to the public during all or part of the summer season, May through September. Some also have winter hours or may be visited during the off season by special arrangement. The Norwegian Museum of Cultural History is open year-round. I have a painting of a church in Bergen Norway. It is said this church was set on fire in 1994 then rebuilt. The signature on the painting is not clear. The description say Funluff Slavkirke Bergen, the best I read. Does anyone know of a painting’s artist? No date on painting.